What better way to celebrate Christmas in July but with cookies. The Hallmark channel is in full swing with showing their Christmas movies this week and you better believe that I’m watching as many of them as I can. It’s not like I’ve seen them all at least 7 times each or anything. 😉 It’s definitely getting me in the mood for the holidays. In fact, I almost bought marshmallows and hot cocoa. I ended up not buying them because I figured one cup would satisfy the nostalgic craving and then I’d mindlessly consume the rest of the bag of marshmallows by myself. Not that there’s anything wrong with that, except for all the things that are obviously wrong with that, but I don’t think my waistline would thank me. Anyway, I actually made these chocolate chip cookies for our annual family trip to Lake George last month. It’s a tradition that my husband and I make chocolate chip cookies every year. Sometimes it’s a bake off where we bring up multiple versions (made by both of us) for the opinions of those consuming them. Other times we just bring a single batch of cookies and there is no voting, just happy eating. 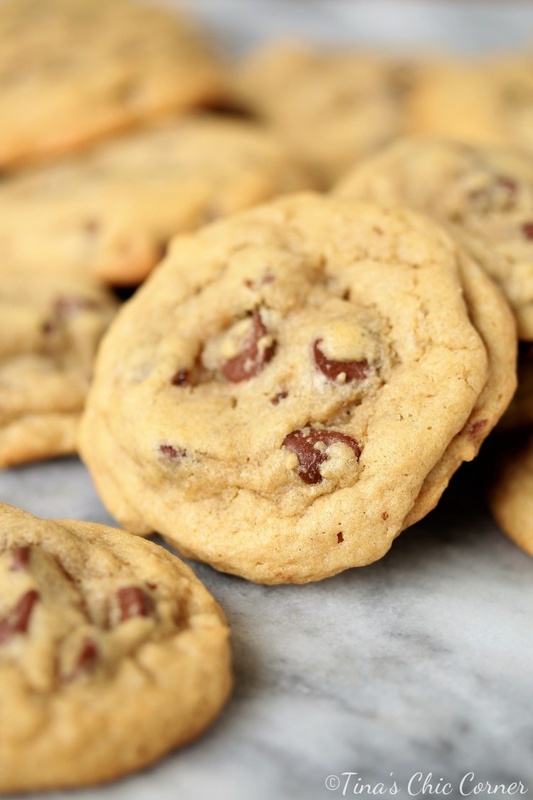 Usually, at the request of one of my sisters, I make “Panera” chocolate chip cookies (my family calls them Panera cookies because they resemble the chocolate chipper cookie). While those cookies are the bomb digity, they require more ingredients and time (i.e. chilling time in the fridge) and I just wasn’t feeling up to making them. 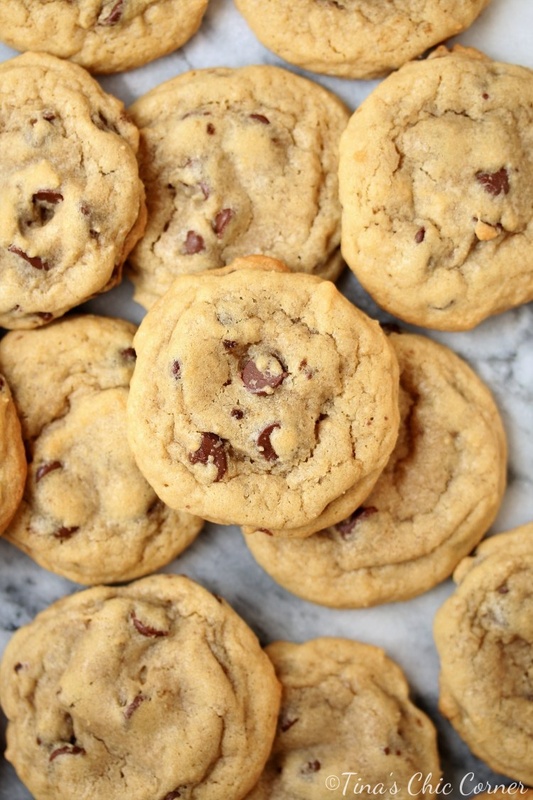 My husband and I have made these chocolate chip cookies many, many times. In fact, it’s really his recipe that he was making for years before we even met, so I think he’s made it many more times than I have. Every time we turn to my blog for the recipe we are surprised all over again that I have never blogged about it. Seriously, we’ve fed hundreds of these to everyone we know, and we can’t just pull it up on the blog when we want to make them. Our best theory is that it has been missing on the blog not for a lack of desire to have it online, but rather for a simple lack of time to actually write it up and take pictures of it. Well, I’m finally sharing the recipe with you now. I have used this cookie dough recipe before for other cookies that I’ve shared with you, but over the years my husband and I feel like we’ve perfected the recipe. More specifically I’m referring to the amount of flour to use. Flour is my nemesis. It can make or break a cookie (or any baked good really). 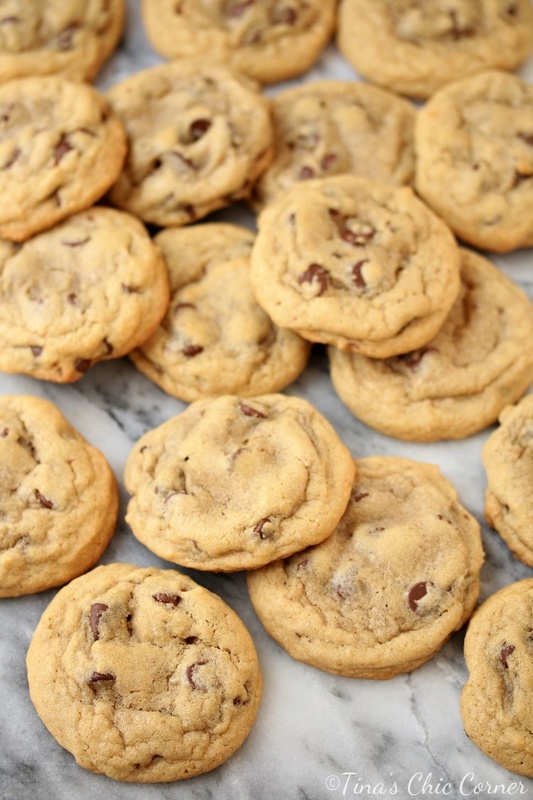 If you use less flour then you get a flat and greasy cookie, like the dark chocolate chunk cookies. If you use more flour then you get a thicker and drier cookie, like the M&M cookies. Both of those cookies are delicious, but my husband and I prefer our cookie to be somewhere in the middle. That’s where these chocolate chip cookies come in. We feel like we’ve nailed the amount of flour in this recipe to get the ideal ratio of grease, chew, and thickness. 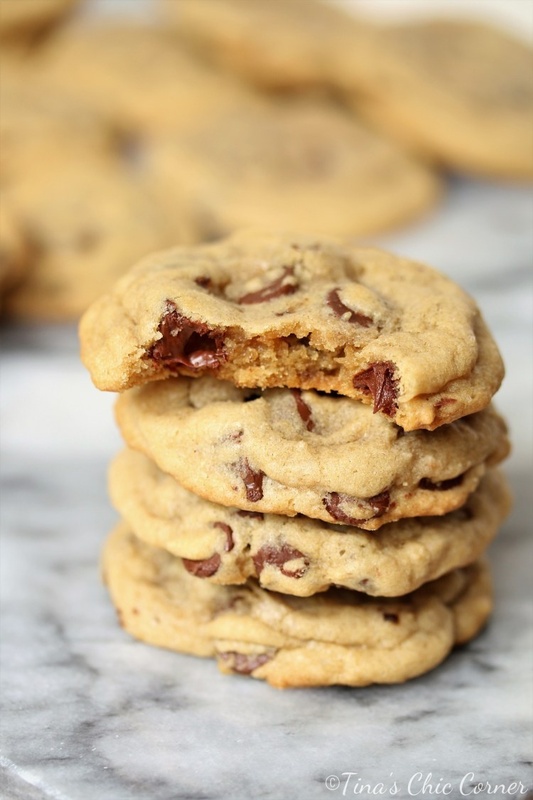 We’re never here to judge so if you prefer your chocolate chip cookie to be more like the dark chocolate chip cookies or M&M cookies then simply turn to those recipes and replace the goodies with chocolate chips. After all this recipe is really the base for practically every cookie that looks a bit like these anywhere on this blog. 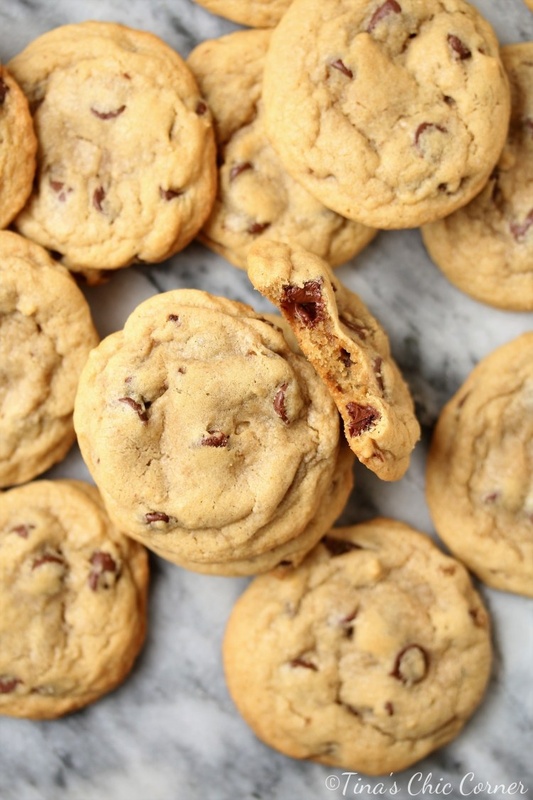 I’m just glad that I’ve finally documented this chocolate chip cookie recipe because I never remember how many chocolate chips to use and I end up having to ask my husband (because he has a better memory than me, and it was his ratio). In a large bowl, cream the butter, white sugar, and brown sugar. Stir in the semi sweet chocolate chips. 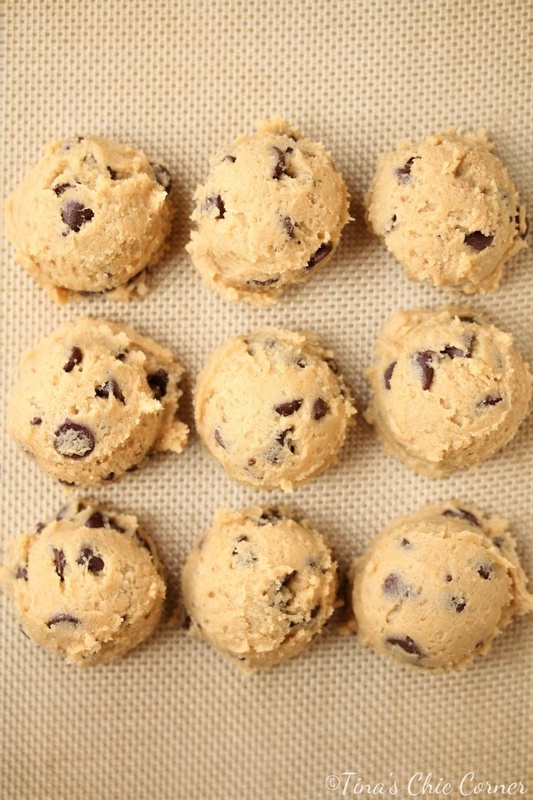 Using a Medium Oxo cookie scoop, scoop the cookie dough onto the mat/parchment paper. Let them rest for about 3 minutes and then transfer them to a cooling rack. These chocolate chip cookies look like Entemann’s cookies. A definite to make!